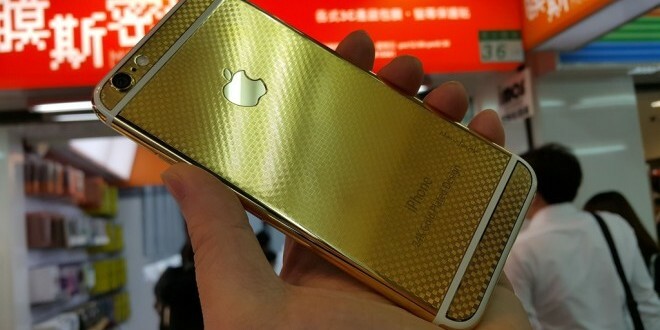 While many people may find it hard to afford a regular iPhone 6 due to its high cost, a Chinese company figured that some of the more wealthy individuals out there could in fact go for a gold-plated version of the handset. The company in question goes by the name of NavJack and has announced 24K gold variants of both the iPhone 6 and the iPhone 6 Plus. Now, the front portion of the smartphone is not really covered in gold, but you can find a gold ring surrounding the home button, which makes for a nice contrast to the rest of the material to be honest. Also on the front, you can find Corning Gorilla Glass 3 protection on the display. The regular iPhone 6 and iPhone 6 Plus come equipped with shatter proof glass, but Corning Gorilla Glass 3 is much more resistant so that’s definitely a nice touch. As for the back cover, we’re looking at what seems to be carbon fiber covered with a layer of gold. This layer is covering most of the back portion except for the Apple logo which still has the familiar silvery color. Not much else to say really, this gold-plated iPhone 6 was clearly developed to allow its owner to stand out from the crowd and it succeeds admirably at that. Whether that’s a good thing or not, well, that’s for you to decide. NavJack didn’t reveal any details about the hardware, but it’s pretty safe to assume that the specs are very same ones found on the regular iPhone 6. Unfortunately, the company didn’t announce the price tag just yet, but it’s likely that this device will cost quite a pretty penny. The iPhone 6 can already reach close to $1,000 so a gold-plated version will likely end up costing two or three times more than that, at the very least.